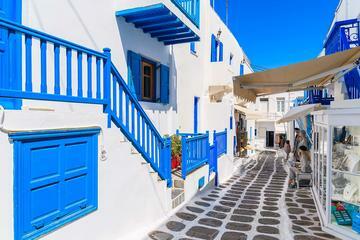 Swap the decks of your cruise ship for the narrow streets of Mykonos Old Town on this private, 2.5-hour walking tour. Meet your guide and vehicle at the port, and then travel to the glamorous Greek island’s historical heart to begin your tour. Stroll along narrow streets and through cobbled alleys, passing whitewashed houses, quaint tavernas and the blue-and-white architecture that typifies the Cyclades. See, too, the waterfront neighborhood of Little Venice and Mykonos’ famous windmills. You’ll also enjoy free time to sightsee independently or unwind at a terrace bar. Awesome tour. Great history and background from our guide. Pleasant and unrushed. She accommodated us on everything we wanted. We felt we had a complete experience. Our guide was more interested in talking than walking. Would not even give us a 10 minute lift to the beach afterwards. Said he had an 11 am tour but it was only around 9:30 when ours was over. Only guide we did not tip. Most expensive tour we took of all 3 and hands down the worst and hardly worth even half the price as it turned out. Guide was very pleasant however she smoked at each stop which was not very pleasant for non smokers.